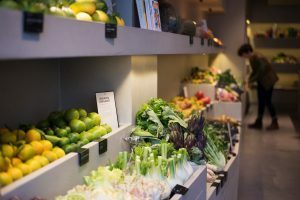 Sloane Stanley has announced that Natoora, the innovative fruit and vegetable specialist that supplies over 600 of London’s best restaurants with outstanding produce, has officially opened its 540 sq ft standalone store at 309 Fulham Road. Natoora’s radically seasonal retail space sidesteps traditional grocery store cues with a minimalist design that finds its root in the soil. The store’s geology-inspired layout was designed by Argentinian architect Noé Golomb with London-based cabinet makers FincH and aims to restore the real value of farming, equating the cultivation of produce with other forms of craftmanship. 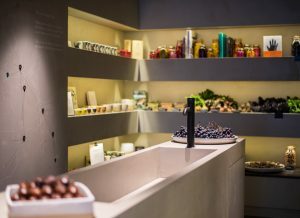 Only using two materials, warm-toned grey cement and Foresso Charcoal Mono timber, products are organised according to their seasonal window, starting with early season produce and culminating in a fermentation and preserving room in a cellar-like space found in the rear end of the unit. This news follows the recent announcement that the chic bakery brand founded by award winning cake designer, Peggy Porschen, is due to open their new flagship 2,400 sq ft Parlour located at 219 King’s Road in Chelsea early next year. Savills and Miles Commercial represented Sloane Stanley. BC Retail represented Natoora.